DC Motor Drive - SCR Dart’s top of the line DC speed control is reliable, versatile, and economical. Rated to 3 horsepower, it provides many standard features typically offered as options. 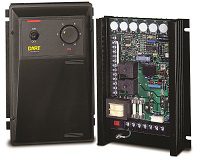 The Dart 530B Series control combines advanced engineering design, quality component selection and rigorous quality control to deliver an excellent off-the-shelf SCR control. Dependable, time-proven circuitry offers performance characteristics previously available only in more costly controls. While providing a wide range of standard features, many options quickly and easily extend the 530B Series capabilities to meet specific application requirements. An integral part of a distinguished line of quality products, the 530B Series is representative of Dart’s continuing effort to provide reliable, versatile controls to the OEM, distributor, and the industrial market.